All student assignments and events, as well as school-wide and group events posted by others and concerning the student will be displayed on their calendar. Scroll down the Student Record page to see a week view of the student's calendar. Staff can see everything on student calendars. Click the blue arrow icons at the top left and right to move forward or backward by week. Click the Calendar view icons to switch to Day, Week, or Month views. 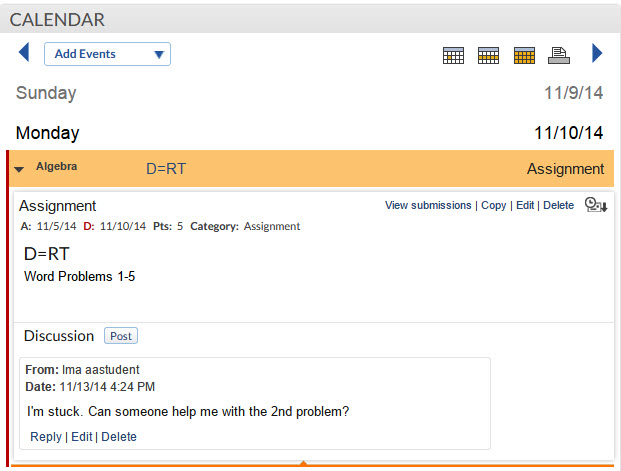 Click on an Assignment or event in the calendar to display details including attachments and discussions.